CIRQUE DREAMS HOLIDAZE at MGM: The most magical holiday show of the season! 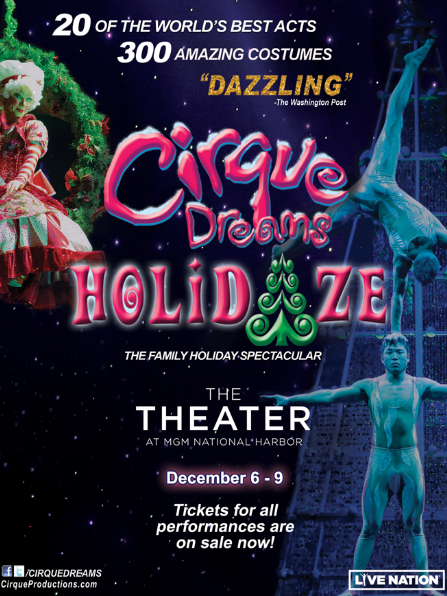 Cirque Dreams opens its acclaimed Holidaze show at The Theater at MGM National Harbor on Wednesday, December 6th and runs through Saturday, December 9th. Get tickets before they are gone! For its 10th Anniversary National Tour, the critically-acclaimed holiday stage extravaganza makes it way to the MGM National Harbor’s gorgeous theater for this cirque spectacle. We cannot wait to see this show which reviewers say is a Broadway musical and family show all in one! I am taking my kids to the opening night show, and we are excited to see the soaring acrobatics, gravity defying feats, elaborate production numbers and illusions, and also to see our first show in the MGM venue! We are receiving tickets for review. No additional compensation received.